RANGOON — The sweeping reforms Burma announced in 2011 after a half-century of crushing military rule seemed too good to be true to much of the outside world. And to some degree, they were. Burmese citizens are experiencing an unprecedented degree of economic and political freedom, but the balance of power has changed little. Most of those in charge are former military men who have just swapped their khakis for suits and longyi—the sarong-type skirt traditionally favored by both men and women in Burma. Opposition leader Aung San Suu Kyi, whom the junta kept under house arrest for years, now tours the country stumping for votes. But even if her National League for Democracy wins the Nov. 8 election in a landslide, the odds are that the generals and their cronies will continue to dominate both politics and the economy. Many familiar with Burma’s government say that while it has made significant reforms in the past five years, it still faces a long journey to achieve a stable, prosperous democracy. Conditions for the majority of Burma citizens living in the countryside are little changed. Many of them survive on less than $1.25 a day, and with per capita GDP of about $810, it is one of the poorest countries in Asia. Many political prisoners were released after reforms began, but dissidents are still frequently jailed, and the press, though not openly controlled by the government, often censors itself out of fear. The military control most government appointments and operate with virtual impunity. “If you’re looking at the big picture of, ‘Is the military stepping down tomorrow?’ Well, of course not. But I’m not sure anyone who…really understood history would have expected that,” said Vicky Bowman, a former British ambassador to Burma who now runs a nongovernmental organization in Rangoon, the Burma Center for Responsible Business. “But the reforms are so big, and anyone who thinks you can do that quickly is deluding themselves,” she said during a recent interview at a popular cafe favored by Rangoon’s growing middle class. Reforms implemented so far have been under President Sein Thein, a former general who was handpicked by former dictator Than Shwe, continues to enjoy military support and hopes to win another term. He was elected in 2010, in a vote the NLD boycotted and that was viewed internationally as neither free nor fair. The military defined the limits of its tolerance for change when it forced, in the dead of the night, the ouster of Shwe Mann, a former general and speaker of the house, as head of the ruling Union Solidarity and Development Party in August. Shwe Mann had favored revisions to the constitution to curb the military’s powers and was viewed as a likely contender for president after the election, possibly in a coalition with the NLD. “After more than 50 years, it’s just what I would expect from them. Nothing surprises me,” Kyee Myint, a Rangoon lawyer who was imprisoned four times by the former military regime, said of Shwe Mann’s ouster. Kyee Myint is among many who view the reforms launched in 2010 as the military’s last-ditch strategy for averting an outright revolt along the lines of the Arab Spring. The groundwork was laid with a 2008 Constitution that ensures a quarter of the seats in parliament go to the military and effectively bars Suu Kyi from the presidency. Since amendments must be approved by more than 75 percent of Parliament, the constitution cannot be changed without military support. “They’ve been preparing more than 14 years and have ensured that everything is systematically protected for them,” said Kyee Myint, who was among many lawyers involved in a “yellow ribbon” campaign against appointments of former soldiers to judicial posts. That followed a “black ribbon” movement launched by health workers against appointments of military personnel with no medical training to hospitals. A “white ribbon” campaign took aim at errors on the voter registration lists. Other, similar campaigns were reported for teachers and even electricians. Burma’s military holds the right to appoint ministers to the posts of Ministry of Home Affairs, the Ministry of Border Affairs and the Defense Ministry. The Ministry of Home Affairs is in charge of the General Administration Department, which basically controls the entire administration, from the village level up. “The cronies are as strong as ever. It’s still very apparent,” said Sean Turnell, a Burma expert at Australia’s Macquarie University. Kyee Myint says he worries the military might foment trouble if the NLD manages to win the 67 percent of seats up for election that would give it an absolute majority, due to the military’s 25 percent quota. But many familiar with Burma’s politics believe the military and other elites prefer to avoid criticism from the US and other trading partners, and would rather focus on making money from their new businesses and property investments. Young National League for Democracy supporters at Thuwanna Pagoda for Sunday’s campaign rally. While Burma is nowhere close to establishing an independent court system, it is making progress in developing its legal profession and judiciary, Aguirre said. He added that a drastic lack of resources encourages corruption and further undermines the courts’ independence. How fair the upcoming election will be remains an open question. More than 6,000 candidates from more than 90 political parties, many of them representing ethnic minorities who comprise nearly 40 percent of the population, are competing for 498 seats in the upper and lower houses of the Hluttaw, Burma’s parliament. But many have been shut out of the process, in particular more than 525,000 members of the Muslim Rohingya community. Rohingya are considered Bangladeshis by the government and denied citizenship even if they’ve lived in the country for generations. They had been allowed to vote in 2010, but growing freedom in Burma has also given rise to a wave of Buddhist nationalism. Mobs attacked Rohingya in 2012, leaving more than 200 dead and forcing 140,000 from their homes. The country is about 90 percent Buddhist. Monks are legally banned from politicking or voting in elections, but the Thein Sein government has enacted legislation favoring the Burman Buddhist majority, such as restrictions on interfaith marriages. All but 11 Muslim candidates were prevented from running in the election, and critics say many thousands more eligible voters were excluded from the registration lists. Despite those flaws, even critics see promise in the electoral process. 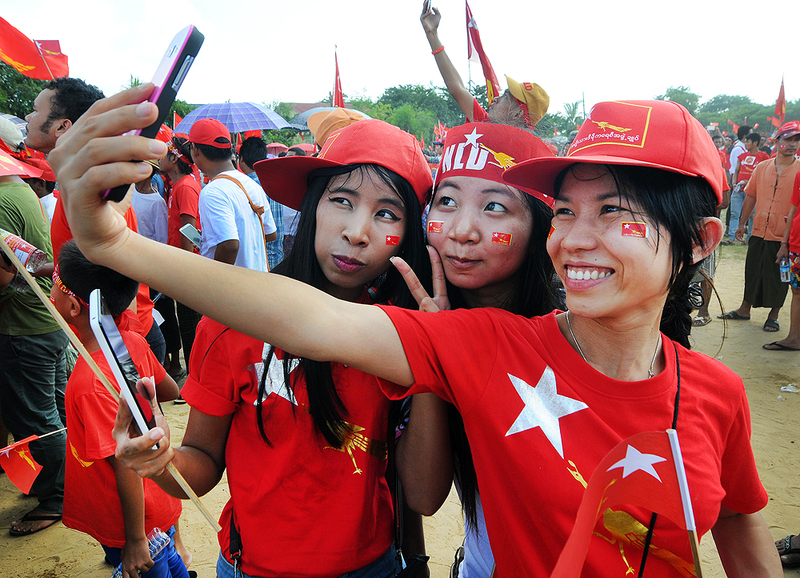 Top Photo - ( Steve Tickner / The Irrawaddy ) National League for Democracy supporters at a Sunday campaign rally in Rangoon.